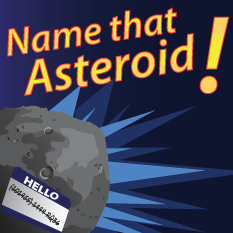 Students worldwide have an opportunity to name an asteroid from which an upcoming NASA mission will return samples to Earth. Scheduled to launch in 2016, the mission is called the Origins-Spectral Interpretation-Resource Identification-Security-Regolith Explorer, or OSIRIS-REx. The competition is open to students under age 18. Each contestant can submit one name, up to 16 characters long. Entries must include a short explanation and rationale for the name. The contest deadline is Dec. 2, 2012. For contest rules, guidelines, and application visit: http://planetary.org/name. For more information about the OSIRIS-REx mission, visit: http://osiris-rex.lpl.arizona.edu. Here’s an exciting opportunity to involve your students in the unique RealWorld-InWorld NASA Engineering Design Challenge to solve real NASA-related problems. There are two phases to the RealWorld-InWorld challenge. The challenge begins in the RealWorld where students in grades 8-12 use the engineering design process to solve one of two problems related to the James Webb Space Telescope. Educator and student RealWorld resources will be available on September 1. Upon completion of RealWorld registration, teachers and others guiding students through the RealWorld design phase may register to use PTC Creo professional engineering software along with free online training valued at more than $900,000. Twenty selected RealWorld teams are mentored by college engineering students, InWorld, in a virtual world setting. Team leader registration and InWorld resources will be available on September 1. 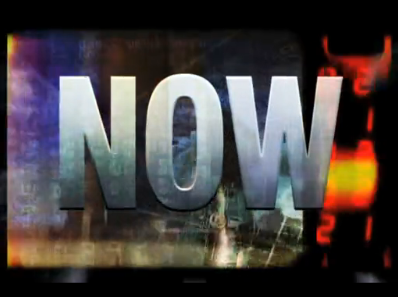 The InWorld phase begins January 31, 2013 following the completion of the RealWorld phase. For more information about this exciting challenge, visit the RealWorld-InWorld website. NASA Explorer Schools educator Cheryl May at Lebanon Middle School challenged her 7th-grade science and technology students by adding her own extensions to the Sun-Earth-Moon Model activity. 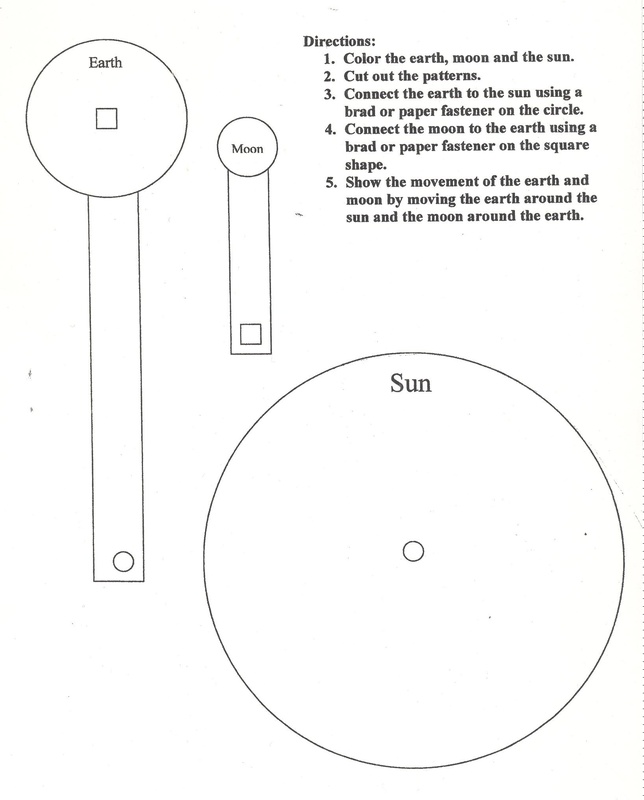 In the activity, students create a model of the Earth, sun and moon system. Students observe the moon’s orbit of Earth simultaneously with Earth’s orbit of the sun. This is an effective way to model eclipses and the position of Earth, the moon and the sun during the moon’s phases. May knew the science applications were evident, but she was able to connect the model to mathematics by requiring students to measure angles. She took a step further and encouraged her students’ creativity by adding an engineering challenge. This model activity increases student ability to apply mathematics, science, engineering, and geography concepts and skills in meaningful ways. Read about the engineering design challenge May added to this activity in NEON. The complete story is available there, as well as step-by-step instructions for using this activity in your classroom. Key Peninsula Middle School and Potlatch Elementary School have experiments that were selected to be conducted this spring in the microgravity environment aboard the International Space Station. Both schools are participating in the NASA Explorer Schools project. Key Peninsula Middle School in Lakebay, Wash., proposed an experiment, “Pondering the Pendulum.” Their experiment will examine the effects of microgravity on a pendulum. Potlatch Elementary in Potlatch, Idaho, will be testing, “Pepper Oil Surprise.” It’s an experiment to determine if the buoyancy of an object is affected in a microgravity environment. This activity reinforces the use of technology to facilitate student collaboration in the use of NES materials and NASA opportunities. These teachers are well on their way to earning NES recognition. Click here for information about the NES Recognition Opportunities. Click here for information about the Kids in Micro-g! challenge. Potlatch Students Recycle Water for the Moon! Are you looking for a classroom project that helps students learn about water purification as they work in groups? Like NES educator Laura Wommack, you should check out the Water Limitation Management Water Recycling activity, an extension of the Engineering Design Challenge, Water Filtration. Laura Wommack, NES educator at Potlatch Junior-Senior High School, completed the Waste Limitation Management Water Recycling Design Challenge with her eighth-grade students. This NASA project challenges students build a water purification system that could be used on the moon. Learn how she used this contest to motivate her students. Learn more about the Waste Limitation Management Water Recycling Design Challenge at the Teachers Corner. Link to the NES Virtual Campus. 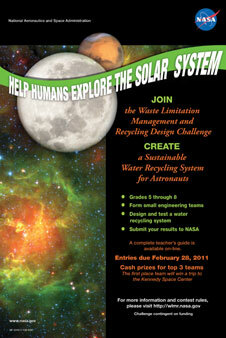 Author John EntwistlePosted on February 3, 2011 Categories UncategorizedTags Design Challenge for Students, Education Point of Interest, Middle School Students, NES Lesson, NES Lesson-Engineering Design Challenge-Water Filtration, Student Contest, Student Opportunity1 Comment on Potlatch Students Recycle Water for the Moon! Registration for the 18th Annual Great Moonbuggy Race opens Oct. 1, 2010. This year’s event will be held April 1-2, 2011, in Huntsville, Ala., at the U.S. Space & Rocket Center. Deadline for registration is Feb. 1, 2011. In this competition, high school students design a vehicle that addresses a series of engineering problems. Each moonbuggy will be human-powered and will carry two students, one female and one male, over a half-mile simulated lunar terrain course including “craters,” rocks, “lava” ridges, inclines and “lunar” soil. Prizes will be awarded to the top three winning teams in the High School Division. Additional awards will be given, including a prize to the team whose moonbuggy design represents the best technical approach toward solving the engineering problem of navigating the lunar surface. The NASA Now program series highlights a current NASA mission,area of research, or career within the agency. In this, our first program of the 2010-2011 school year, introduce your science or technology classes toone of the many complex problems associated with living and working on the moonor another planetary body. In this NASA Now episode, students get a glimpse at theresearch conducted at NASA’s Lunar SLOPE facility, where scientists andengineers design, build and test wheels for the next generation rover vehicle. Studentssee how the SLOPE scientists and engineers test their prototype wheels on anartificial lunar surface developed especially for this project. Students will geta feel for how the unique properties of the lunar soil shape the design of thewheels. The event is available atthe NES Virtual Campus’s NASA Now page beginning Wednesday, Sept. 22, 2010. Visit the NASA Explorer Schools home page and click on NASA Now! Earth Science Week 2010 Photography Contest — Open to All Ages. Deadline for submissions is Oct. 15. 2010. Microgravity Competition — High School. Deadline for proposals is Nov 1. 2010. Link to the NASA Explorer Schools home page. NASA is inviting students in grades 5-8 to participate in the 2nd Waste Limitation Management and Recycling Design Challenge. The challenge uses real-world scenarios that meet science and mathematics content standards. Students can participate in a formal, informal or home-school setting. Teams of up to six students will design a water recycling system for the unique environment of the moon. Teams will then test their system on a simulated wastewater stream. Proposals and results are due Feb. 28, 2011. The winning teams will be announced in May 2011. The top three teams will receive awards. The first place team will receive an expense-paid trip to NASA’s Kennedy Space Center in Florida. During the winning team’s visit to Kennedy, students will gain firsthand knowledge about NASA’s missions, receive behind-the-scenes tours of NASA’s launch facilities, and learn about future aerospace and engineering careers. For more information and contest rules, please visit http://wlmr.nasa.gov/. Download a copy of the Design Challenge flyer. Questions about the challenge should be directed to Jay Garland. Link to the NASA Explorer Schools Virtual Campus.